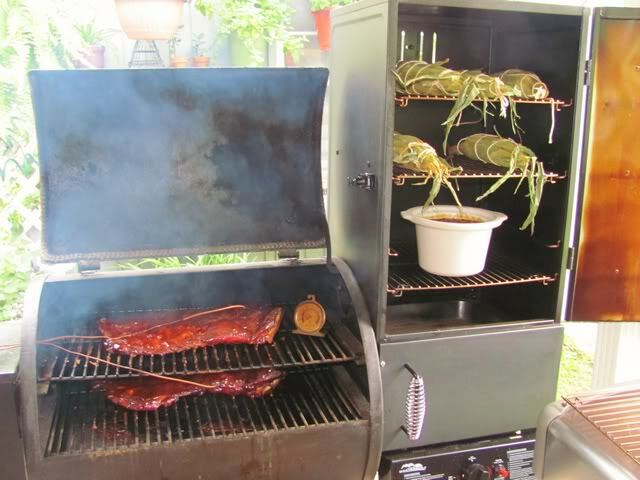 I am looking a pot to bake beans in my Smoker/Roast/Grill to replace the one I am using in the Pic. My lovely bride caught me using it and took it back . This is the traditional pot used for Boston baked beans. A white pot in a smoker ?!? I'd probably take it back too. Run, don't walk, to your nearest thrift store and pick up a used Crockpot, the kind with removable pot. Sometimes you can find just the insert. You may have to keep going back until you can get ahold of one. Garage sales and especially estate sales are also great places to look. Meanwhile, Promise the Missus you'll be careful with hers and Please loan it back until you come up with one for the smoker. Can't beat cast iron. Something with a domed top, since you won't be setting charcoal on it. You can use it stovetop and in the oven, too. I think I have a Lodge 3qt. Andy, I have several antique bean pots like the one you show. I don;t bake beans in them, although I have. I don't bake anything in them. I use them to store my cookie cutters and they look nice displayed on top of the cupboards. The pot I was using came out of small crock pot. Crock Pot insert = Great idea as that is what I use to use. Cast Iron = I will check Bass Pro Shop tomorrow and see what they have. All are great ideas so thanks much.